The Torrent 7100 WTS (WiMAX Test System) is the world's first test system for ASN gateways and CSNs (Press Release) and has been in the field since September of 2006. As illustrated above, the Torrent 7100 consists of a suite of servers that work together in a unified manner to provide a realistic, high performance, lineraly-scalable Mobile WiMAX test solution. The central controller for the system is the Linux based CS-7100. 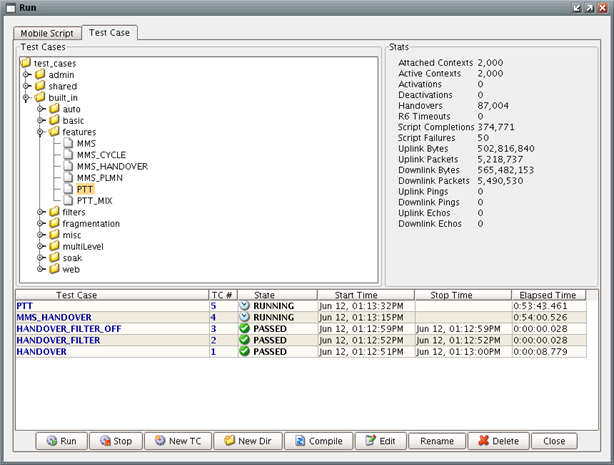 This server automatically configures, starts, and directs the traffic servers in the system to run tests as directed by the user through the UI-7100 GUI. The MTS-7100 traffic server authentically simulates up to 2,000,000 mobiles and up to 5000+ base stations on a single Linux machine. 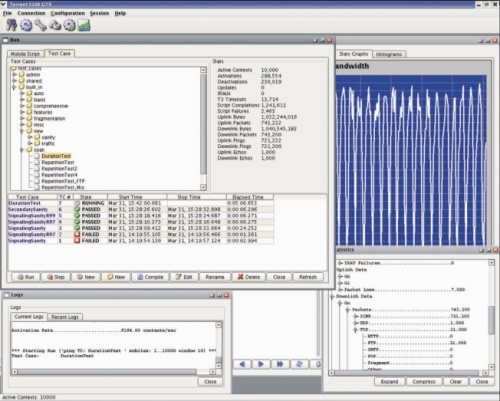 The ASN-7100 simulates an ASN Gateway which can be useful for testing CSNs or testing R4/R6 mobility. Similarily, the CSN-7100 can simulate a CSN Node for ASN Gateway testing. Finally, the NTS-7100 provides a convenient aggregation of network servers (MMS, PoC, WAP, HTTP, FTP, SMTP, etc.). Because the entire network aroudn the system under test is authentically simulated, compelex tests such as inter-ASN gateway handover with ensuing R3 relocation and authenticator relocation can be performed -- all with concurrent data path continuity testing. Because our systems run primarily on Linux, off-the-shelf PC hardware can be used. Thus the Torrent solution rides both the PC hardware power curve and the Linux operating system power curve. As a convenience, Mobile Metrics certified hardware platforms may be used if desired. The Torrent 7100 features a simple installation process and intuitive multi-user GUI. And it does not require programming knowledge to operate. All control and data messages and their associated message flows may easily be modified by the end user using oru patent-pending filtering layer. 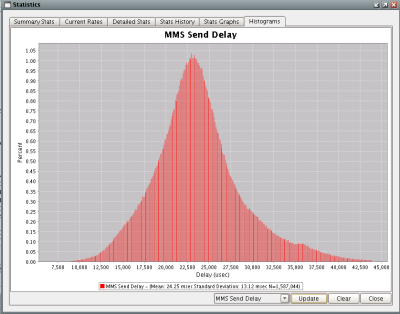 This allows a virtually limitless number of error scenarios or unusual messages flows to be tested. Dataplane functionality is seamlessly and naturally integrated into the system. Each mobile directly supports: IP, TCP, UDP, HTTP, WAP, MMS, PTT (PoC), SIP, RTP, RTCP, FTP, SMTP, POP3, ICMP, DHCP, and DNS. Please feel free to request a free, no-obligation, demo of the 7100 in action, or contact sales for further information.